They sell from their trailer on Castlerock Promenade as well as shows and events across Northern Ireland. They also have a vintage VW converted into an Ice Cream Van which is available to hire for weddings, parties and functions. 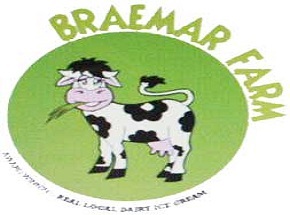 Braemar Farm supply a number of local restaurants and cafes. Fresh, Natural and Udderly Scrumptious. Vanilla Dream, Hokey Pokey, Raspberry Rippled, Strawberry Fields, Mint Sensation, Bubblegum, Banana, Salted Caramel & Fudge etc.... A range of fruit sorbets. Their unique Cow Pat Ice Cream with chocolate brownies and chocolate sauce is one of their most popular.